Your running shoes provide cushioning, shock absorption and stability and over time, like any other often used item, they wear out. 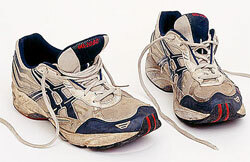 As a general rule, running shoes last about 300-400 miles, while walking shoes last around 500. You can also examine the shoes for wear patterns. It turns out that you don’t use the treads on the bottom of the shoes to determine whether to replace them, nor does the fact that they’re dirty mean you need to replace them. Instead, examine the midsole area. 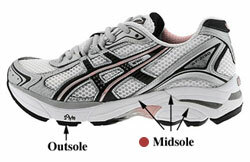 To determine if the midsoles of your shoes are compressed and are no longer providing cushioning, do the press test. Using your thumb, push on the outsole upward into the midsole. With new shoes, it should be easy to see the midsole compress into lines or wrinkles. As the shoe wears down, the midsole compresses less with the same amount of pressure. When the midsole shows heavy compression lines and the press test reveals a minimal amount of compression, there is little or no cushioning left. Time for new shoes. Other telltale signs of a sub-par midsole are mostly seen in how you feel when you run. If your leg muscles, especially calf muscles, are feeling more fatigued than usual, or you get shin splints, or you’re feeling pain in your knees, it may be time for a change. Most serious runners change their shoes every 300-500 miles, depending on whether you run on grass or concrete, your running style, and body weight. The heavier you are, the more often you’ll need shoes. If you want to extend the life of your shoes, take care in putting them on – don’t just slip your foot into them, untie and retie the laces (this saves the heel). Do NOT put them in the washing machine or dryer, use a brush, mid soap and water, then air dry. May runners also alternate between two pairs of running shoes, giving each pair time to air out and decompress between runs. Not too short: You should have about a thumb’s width between the end of your longest toe and the front of the shoe. Not too tight: Snug, but not overly tight at the heel: Be sure there is little or no slipping at the heel. Socks matter: Wear the same kind of socks you normally wear when you run to try on the shoes. Know your width: about 1 in 8 people have wide feet and try to squeeze into standard width shoes. As an experiment, find a shoe in your size and try on the “wide” version and see how it feels. You might be surprised. Beware of false promises: Shock-absorbing running does really don’t prevent injuries any better than other shoes, but they might feel better when you run. Brand snobs don’t always win: Don’t buy on brand, buy on comfort (really). When you do replace your shoes, make sure you donate the old ones to a good cause. Goodwill or other organizations accept “in tact” or “carefully used” shoes. Keep ’em clean, toenails trimmed, and if you see something that’s not right, chat with your physician. If your feet get sore, ask your massage therapist to spend some extra time on them next time you go in for a session. 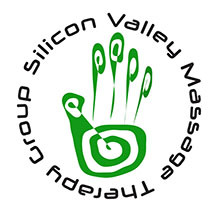 Regular massage is a proven way to reduce foot fatigue, and speed recovery for runners between events. Previous Previous post: Sore Biceps?